So many adventures, so little time to edit and post. I’ll be catching up this week with pictures from Hawaii and the Aikido Common Ground Seminar. This note will stay at the top of the blog until I catch up. I’ll update this post with status. 9/6/10 – Update – 67-64 Four Hawaii pictures. 9/7/10 – Update – 63-60 Four more Hawaii pictures. 9/8/10 – Update – 59-57 Three more Hawaii pictures. 9/12/10 – Update – 56-53 Four more Hawaii pictures. The sun drops behind the cloud layer, hastening the night. In just a few minutes the stars become visible. The last rays of the sun bathe the observatories at the summit of Mauna Kea in golden light while the clouds below us tumble by. 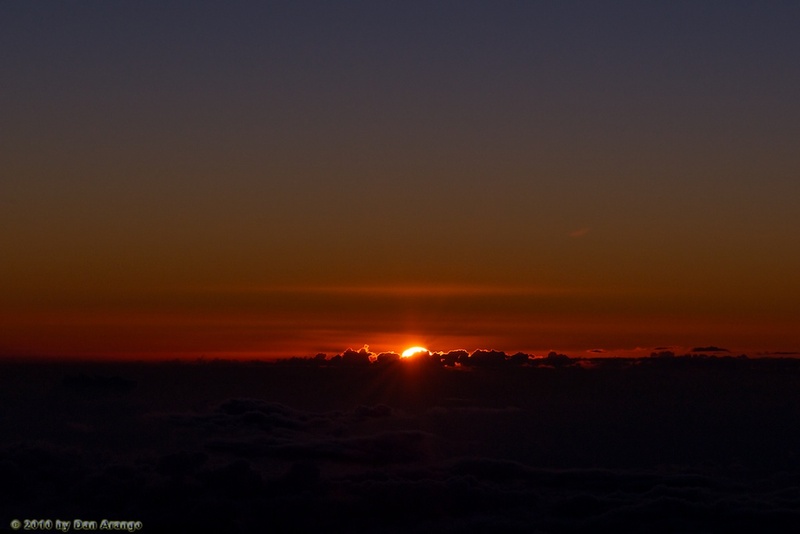 One of the best adventures we had on the Big Island of Hawaii was to book a Mauna Kea sunset tour. 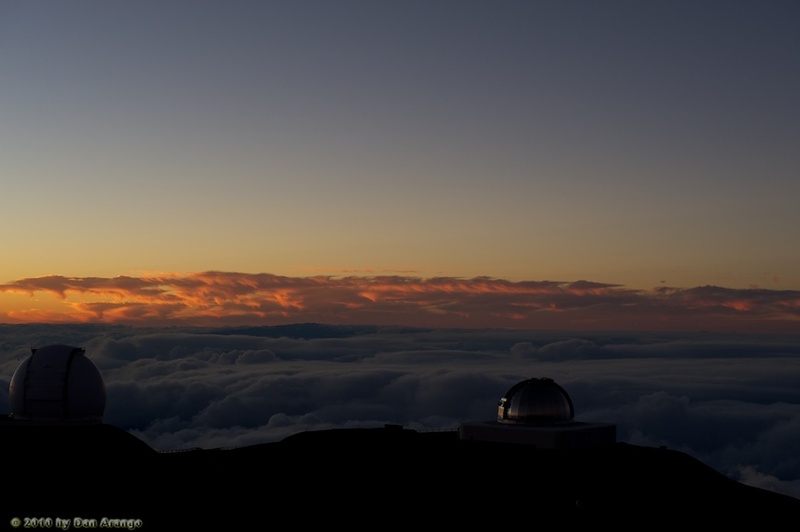 The tour took us in four wheel drive vans to the summit to watch the sun set and learn about the observatories, geology, ecology and spirituality of Mauna Kea. The sun sets beyond the clouds. In the foreground (left to right, you can see Keck II and the NASA Infrared Telescope Facility (IRTF). Pu`u Poliʻahu is prominent cinder cone at the top of Mauna Kea. If you look closely, you’ll see a shrine that appears to be a pair of vertical poles. Poliʻahu is the snow goddess deity. According to legend, she inhabits the summit of Mauna Kea and rules over the northern side of the island, whereas Pele, the volcano goddess, rules Kīlauea and Mauna Loa on the southern side of the island. In winter, Poliʻahu is evident, as it can actually snow at the top of Mauna Kea. It must be quite a thing to go from sun drenched beaches to snow on the same island. Pu`u Wekiu is the highest peak at the summit of Mauna Kea. In this picture, you can see a trail leading to the top where there is a shrine. 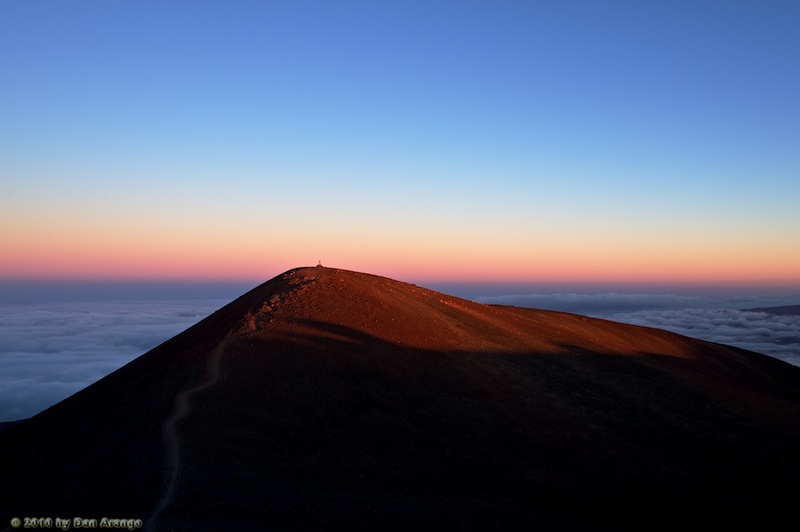 The summit of Mauna Kea is sacred to the original people of Hawaii and their descendants. It is considered a place where deities reside. 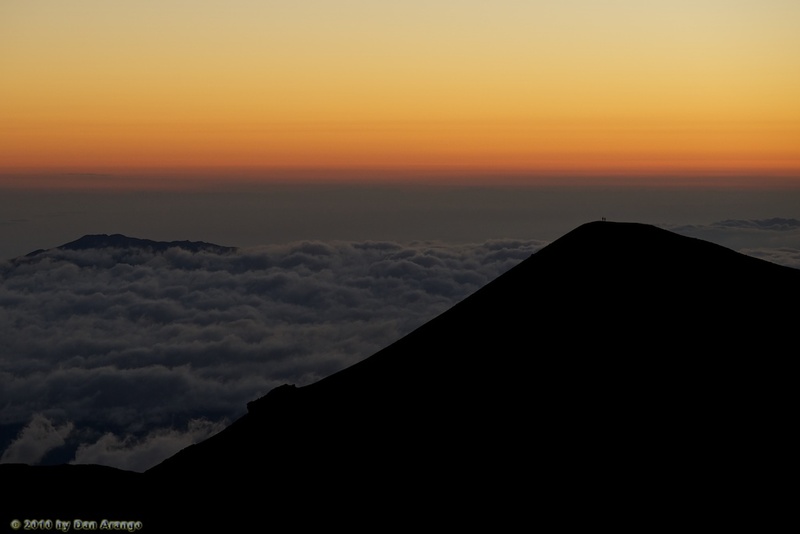 One of the best adventures we had on the Big Island of Hawaii was to book a Mauna Kea sunset tour. 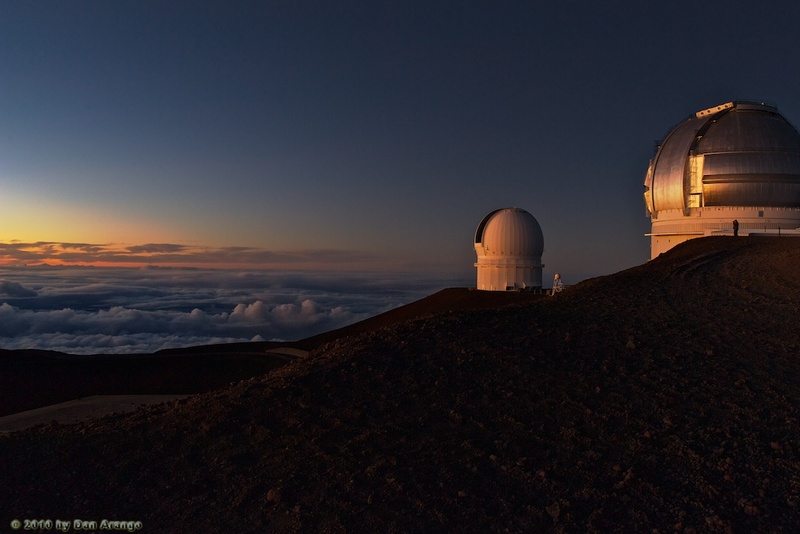 The tour took us in four wheel drive vans to the summit to watch the sun set and learn about the observatories, geology, and ecology of Mauna Kea. 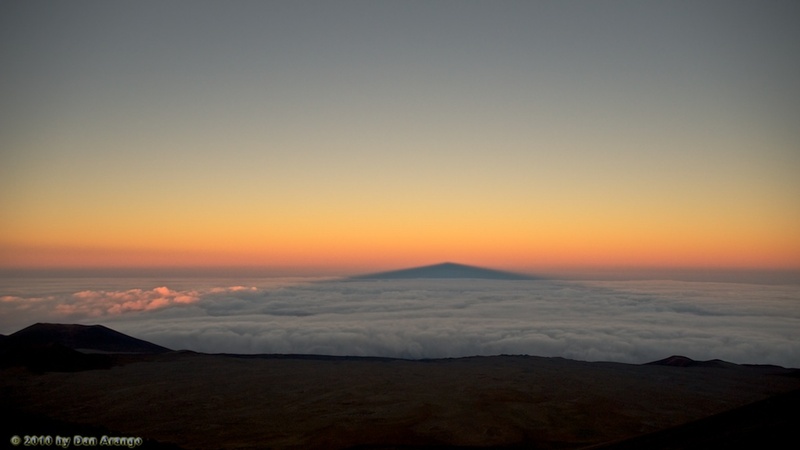 As the sun was setting, I looked to the west (sometimes the better picture is behind you) and was amazed by the sight of Mauna Kea’s shadow spread out across the clouds. It affected me on a primal level – it revealed the magnitude of the mountain in a way that facts and figures about the mountains altitude and size could not. We see shadows every day – we walk under the shadow of trees, we see our own shadows long and short as the sun climbs the sky. But the idea that there could be something so big as to cast a shadow on the tops of clouds? One imaginative image posted per day. Images taken within a week of posting. Inspiration – because sometimes it’s hard to take another picture.